Ric Birch moved his base from Mexico City to Shanghai in early 2011. Upon arriving, he was asked by Michael Sun of the Shanghai City Entertainment Group to create a new version of The Nutcracker Ballet that would integrate Chinese acrobats into the world of western ballet. Michael had done this once before, when he produced the Acrobatic version of Swan Lake to great international acclaim, so Birch was delighted to be able to work with Liu Jun, who had choreographed Swan Lake but was now to be the creative director for Nutcracker Magic. The two developed a script outline that bent the boundaries of the traditional ballet and Birch then assembled some international creative friends to help out - Daniel Ezralow who had choreographing Spiderman in New York came on as Director of Choreography and brought his assistant Michael Pena who trained as a dancer and an acrobat so was able to contribute additional magic; Carlos Navarrete-Patiño, who had worked on the Mexican Bicentenary, joined in a Production Designer: Roger Kirk, a long-time friend and winner of many design awards, came aboard as the Costume Designer and John Rayment who has worked with Ric in the past, brought his aesthetic and technical skills along as Lighting Designer. 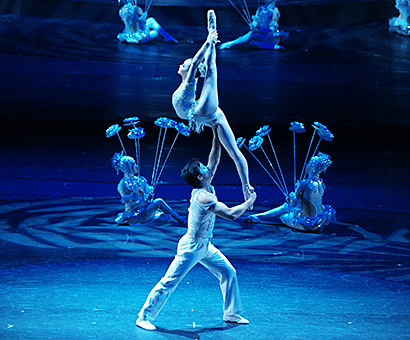 The foreign contingent spent many weeks in Tianjing, working with the Acrobatic Troupe there, building up to the première performance at the new Shanghai Cultural Square Theatre, as part of the 2011 International Arts Festival.